I2SL is pleased to acknowledge the winners of the 2018 Go Beyond Awards. Go Beyond Award winners show their commitment to excellence in sustainability in laboratory and other high-technology facility projects by going beyond the facility itself to consider shared resources, infrastructure and services, and neighboring communities, as well as contributing to increased use of energy-efficient and environmentally-sustainable designs, systems, and products. 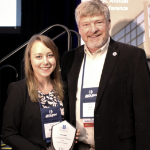 Alison has been a strong advocate for I2SL since she began as the membership coordinator for the I2SL New England Chapter—a trend she continues in her current role as Vice President of the Northern California Chapter. A pioneer of benchmarking, Alison introduced and demonstrated the value of tracking performance metrics for lab buildings. Her enthusiasm for the concept drove her to develop the first energy score for lab facilities. The results she captured provided valuable insights to the owners of more than 150 lab buildings in the Boston area. Alison is a prominent member of the lab community who has shared her wisdom by presenting about lab benchmarking at numerous conferences in the U.S. and the S-Lab conference in the U.K. She has chaired I2SL’s Lab Benchmarking Working Group since it started in 2014, and she was instrumental in developing I2SL’s proposal to the National Institute for Standards and Technology to enhance the existing Labs21 Benchmarking Tool. Erika started in a leadership role at My Green Lab in 2016, where she helps companies and universities deliver safer, more efficient research and teaching spaces with a lower environmental impact. For example, Erika worked with UC San Diego’s Green Labs team to institutionalize a program whose strength and efficacy is now renowned throughout the UC system. The University has saved more than 2 million gallons of water annually, helping them become a 2017 Freezer Challenge winner. 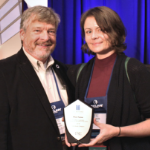 Erika’s hard work and extensive knowledge of lab sustainability have earned her the respect of her colleagues, who praised her work in community engagement, passion for environmental protection, and dedication to communicating the importance of laboratory efficiency. Erika is an enthusiastic sustainability advocate wherever she goes—from site visits at new labs to casual hikes with friends—and she inspires scientists to act to make their research more sustainable. The New England Chapter Officers and members demonstrated tremendous teamwork to ensure the 2017 I2SL Annual Conference in Boston was a success. 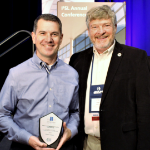 Through their relationships, they raised more in conference sponsorships than we have ever raised, and they secured Matthew Beaton, Secretary of Massachusetts Office of Energy and Environmental Affairs as the 2017 keynote speaker. The chapter also worked with the Boston Green Ribbon Commission and the Cambridge Compact for a Sustainable Future to organize an excellent Opening Plenary panel for the 2017 conference. In 2018, the chapter created a student design competition that will be held in the coming months to raise awareness about the radical challenges climate change and infrastructure fragility pose to lab facility design. 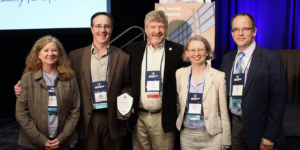 Through these initiatives and many others, the chapter has been—and continues to be—a strong advocate for sustainable labs. They plan events, encourage conversations, and build networks to promote I2SL’s vision in a lab-intensive region. 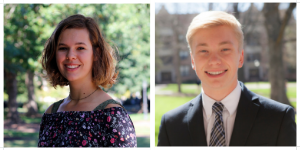 Olivia and Zach are undergraduate students at UNC Chapel Hill who have become active proponents of sustainable laboratories and the University Chancellor’s Three Zeros Environmental Initiative to achieve water neutrality, climate neutrality, and zero waste. They took initiative to develop a freezer rebate program for the university, beginning with faculty researcher interviews to understand their needs. Then, they collaborated with the campus energy engineer to identify energy-efficient freezers that would meet those needs. 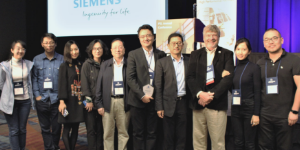 They also worked with the campus procurement office to get discounts to incentivize laboratory principal investigators (PI’s) to purchase the most energy-efficient freezers on the market. Several PI’s have already taken advantage of the program Olivia and Zach developed, and more are expected to participate in 2019. The Energy Research Institute’s striking architectural concept draws its inspiration from sea drilling platforms. It includes columns, bridges, and platforms connecting the four main research and development buildings. The research institute was designed with environmental protection and energy conservation in mind. It is LEED Gold certified and earned the Chinese Green Building system’s three-star label—the system’s highest honor. The work spaces can transform from office to lab space, giving occupants the flexibility they need to complete their research without sacrificing performance and efficiency. Compared to traditional laboratory buildings, this building consumes 60 percent less energy and 42 percent less water. These savings have been good for business too, as the institute saves more than three-hundred thousand dollars annually. The new Science and Engineering Complex created a space for interdisciplinary research in biology, environmental science, and neuroscience by connecting two existing buildings and creating a community hub. The bright, open spaces in the building are deliberately flexible to accommodate new ideas and adapt to ever-changing industries. This LEED Gold certified building leverages existing structures and resources to promote adaptive reuse of materials. It also meets the rigorous environmental performance targets Tufts set for the design team. At its core, the building is doing more with less. It takes advantage of both the old and the new by revitalizing the surrounding historic buildings and employing state-of-the-art resource management systems.